Thermostat® radiant barrier sheathing reflects up to 97% of the sun’s radiant heat from a home’s attic and can help lower attic temperatures by up to 30°F. This improved energy efficiency makes Thermostat radiant barrier the ideal choice for new homes, additions and renovations in warm to hot climates. Exposure 1: OSB suitable for uses not permanently exposed to the weather. Panels classified as Exposure 1 are intended to resist the effects of moisture on structural performance as may occur due to construction delays, or other conditions of similar severity. A radiant barrier is a layer of reflecting aluminum placed in an airspace to block radiant heat transfer between a heat-radiating surface (such as a hot roof) and a heat-absorbing surface (such as conventional attic insulation and your ceilings). How do radiant barriers “block” heat? Heat travels from a warm area to a cool area by a combination of conduction, convection, and radiation. In conduction, heat flows from a hotter material to a colder material when the two materials touch. Heat transfer by convection occurs when a liquid or gas is heated, becomes less dense, and rises. Radiant heat travels in a straight line away from the hot surface and heats anything solid as the wave of energy hits it. The reflective material used in Thermostat radiant barrier sheathing stops up to 97% of the radiant heat from passing through to get into your attic. Additionally, the reflective surface emits very little heat itself, so it does not transfer the heat that it blocks via radiation. In other words, it is a good heat reflector and a poor heat radiator. How do I install Thermostat radiant barrier sheathing? Apply Thermostat radiant barrier sheathing with the reflective (foil) side down towards the attic, directly to the roof framing. For radiant barrier sheathing to be effective long-term, the reflective side must have a minimum 3/4″ air space in front of the foil face to properly reflect radiant heat. This applies to both attic areas and cathedral type ceilings. If I use Thermostat radiant barrier sheathing, do I still need insulation? Yes. Thermostat radiant barrier sheathing is designed to work with, not in lieu of, standard attic insulation. Conventional insulations such as fiberglass, cellulose, foam and others do not insulate against radiant heat transfers. Can Thermostat radiant barrier sheathing damage my shingles? The Reflective Insulation Manufacturers Association (RIMA) has published Technical Bulletin #103, which reports that in peak summer conditions, the temperature of asphalt shingles is increased only an average of 2 to 5° F over radiant barrier roof sheathing. This is not a significant temperature rise and most shingle manufacturers have indicated that it does not affect their shingle warranties. However, you may wish to review your warranty to be sure it will not be voided. Contact your shingle manufacturer directly with any questions and ask for any changes in coverage to be provided in writing. 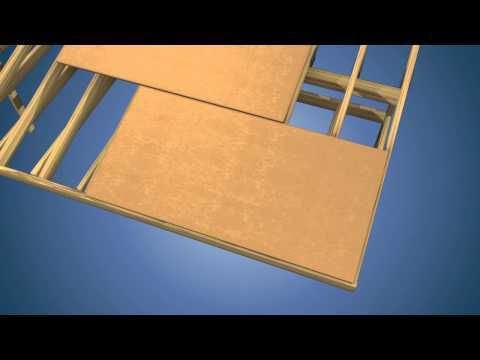 What are the biggest benefits of using Thermostat radiant barrier sheathing in attics? Attic temperatures can be lowered by up to 30°F in the peak summer cooling season. Up to 17% decrease in energy consumption since the cooling system can work more efficiently due to lower attic temperatures. Increase in operational efficiency of cooling equipment because cooler attic temperatures allow attic mounted air conditioning systems and ductwork to operate more efficiently. Increased utilization of home spaces including garages, attics, porches and other spaces that do not have climate control but stay cooler and more comfortable thanks to Thermostat radiant barrier sheathing. Radiant barriers work in the summer months, what about the rest of the year? In summer, when your roof gets very hot, a radiant barrier cuts air-conditioning costs by blocking a sizable portion of the downward heat gain into the building. In the warm spring and fall, radiant barriers can help save on energy and cooling by increasing your personal comfort. During these milder seasons, outdoor air temperatures are comfortable much of the time. Yet solar energy still heats up your roof, insulation, attic air, and ceiling to temperatures that can make you uncomfortably warm. An attic radiant barrier stops almost all of this downward heat transfer so that you can stay comfortable without running your air conditioning during mild weather. How much can I save by using Thermostat radiant barrier sheathing? The house cooling system, which includes insulation levels, roof color, thermostat settings, tightness of the building envelope, climate conditions, design and location of the house, size of house, efficiency of cooling equipment and other factors. The percentage contribution of heat transfer through the ceiling to the home’s cooling load. Cooling load is the amount of heat the air conditioner has to remove to sustain an adequate temperature in the living areas. Tests done by the Department of Energy show that ceiling heat gains represent about 12 to 25 percent of a home’s total cooling load. Since everyone’s home and lifestyle are different, and energy costs differ from area to area, we can’t calculate your exact savings from using Thermostat radiant barrier sheathing on the roof. However, it is reasonable to expect that Thermostat radiant barrier sheathing can save you somewhere between 8 – 17% of your annual cooling energy consumption in the Southeast. Can I use Thermostat radiant barrier sheathing on vaulted ceilings or metal roofs? Yes, Thermostat radiant barrier sheathing can be used in both types of construction as long as you maintain a minimum 3/4″ airspace for the foil surface. In both cases, the foil face should be installed facing down. Where else can I use radiant barrier sheathing? barrier sheathing must be installed with the foil facing the outside. The foil must also have minimum 3/4″ airspace in front of it to be effective. This can be accomplished by using furring strips on the outside of the sheathing to create the 3/4″ airspace between the sheathing’s foil face and the siding, brick or other material used on the exterior of the wall. Be sure to check with your local building codes for compliance in the installation of any siding product. You may also want to check with your siding manufacturer for the use of their siding in conjunction with radiant barrier sheathing. Where can I get more information on radiant barriers?